Having spent a lot of time recently looking at vocabulary apps, I decided to put together a Christmas wish list of the features of my ideal vocabulary app. The list is not exhaustive and I’ve given more attention to some features than others. What (apart from testing) have I missed out? Since the point of a vocabulary app is to help learners memorise vocabulary items, it is hard to imagine a decent system that does not incorporate spaced repetition. Spaced repetition algorithms offer one well-researched way of improving the brain’s ‘forgetting curve’. These algorithms come in different shapes and sizes, and I am not technically competent to judge which is the most efficient. However, as Peter Ellis Jones, the developer of a flashcard system called CardFlash, points out, efficiency is only one half of the rote memorisation problem. If you are not motivated to learn, the cleverness of the algorithm is moot. Fundamentally, learning software needs to be fun, rewarding, and give a solid sense of progression. A spaced repetition algorithm determines the optimum interval between repetitions, but further algorithms will be needed to determine when and with what frequency new items will be added to the deck. Once a system knows how many items a learner needs to learn and the time in which they have to do it, it is possible to determine the timing and frequency of the presentation of new items. But the system cannot know in advance how well an individual learner will learn the items (for any individual, some items will be more readily learnable than others) nor the extent to which learners will live up to their own positive expectations of time spent on-app. As most users of flashcard systems know, it is easy to fall behind, feel swamped and, ultimately, give up. An intelligent system needs to be able to respond to individual variables in order to ensure that the learning load is realistic. A standard flashcard system which simply asks learners to indicate whether they ‘know’ a target item before they flip over the card rapidly becomes extremely boring. A system which tests this knowledge soon becomes equally dull. There needs to be a variety of ways in which learners interact with an app, both for reasons of motivation and learning efficiency. It may be the case that, for an individual user, certain task types lead to more rapid gains in learning. An intelligent, adaptive system should be able to capture this information and modify the selection of task types. Most younger learners and some adult learners will respond well to the inclusion of games within the range of task types. Examples of such games include the puzzles developed by Oliver Rose in his Phrase Maze app to accompany Quizlet practice. Memory researchers have long known about the ‘Generation Effect’ (see for example this piece of research from the Journal of Verbal Learning and Learning Behavior, 1978). Items are better learnt when the learner has to generate, in some (even small) way, the target item, rather than simply reading it. In vocabulary learning, this could be, for example, typing in the target word or, more simply, inserting some missing letters. Systems which incorporate task types that require generative use are likely to result in greater learning gains than simple, static flashcards with target items on one side and definitions or translations on the other. The most basic digital flashcard systems require learners to understand a target item, or to generate it from a definition or translation prompt. Valuable as this may be, it won’t help learners much to use these items productively, since these systems focus exclusively on meaning. In order to do this, information must be provided about collocation, colligation, register, etc and these aspects of word knowledge will need to be focused on within the range of task types. 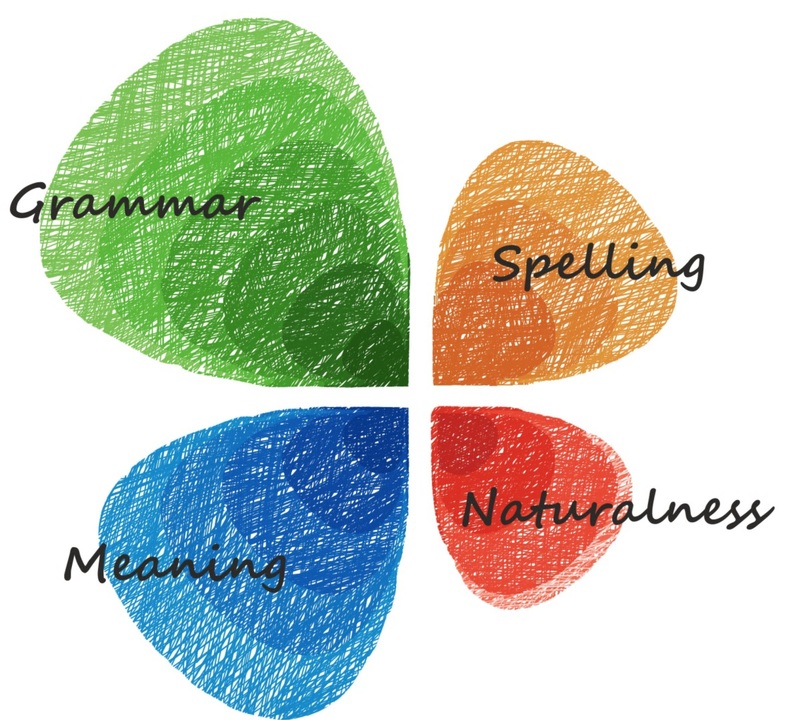 At the same time, most vocabulary apps that I have seen focus primarily on the written word. Although any good system will offer an audio recording of the target item, and many will offer the learner the option of recording themselves, learners are invariably asked to type in their answers, rather than say them. For the latter, speech recognition technology will be needed. Ideally, too, an intelligent system will compare learner recordings with the audio models and provide feedback in such a way that the learner is guided towards a closer reproduction of the model. Most flashcard systems are basically low-stakes, practice self-testing. Research (see, for example, Dunlosky et al’s metastudy ‘Improving Students’ Learning With Effective Learning Techniques: Promising Directions From Cognitive and Educational Psychology’) suggests that, as a learning strategy, practice testing has high utility – indeed, of higher utility than other strategies like keyword mnemonics or highlighting. However, an element of tutoring is likely to enhance practice testing, and, for this, scaffolding and feedback will be needed. If, for example, a learner is unable to produce a correct answer, they will probably benefit from being guided towards it through hints, in the same way as a teacher would elicit in a classroom. Likewise, feedback on why an answer is wrong (as opposed to simply being told that you are wrong), followed by encouragement to try again, is likely to enhance learning. Such feedback might, for example, point out that there is perhaps a spelling problem in the learner’s attempted answer, that the attempted answer is in the wrong part of speech, or that it is semantically close to the correct answer but does not collocate with other words in the text. The incorporation of intelligent feedback of this kind will require a number of NLP tools, since it will never be possible for a human item-writer to anticipate all the possible incorrect answers. 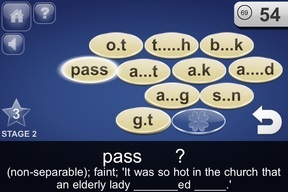 A current example of intelligent feedback of this kind can be found in the Oxford English Vocabulary Trainer app. At the very least, a decent vocabulary app will need good definitions and translations (how many different languages? ), and these will need to be tagged to the senses of the target items. These will need to be supplemented with all the other information that you find in a good learner’s dictionary: syntactic patterns, collocations, cognates, an indication of frequency, etc. The only way of getting this kind of high-quality content is by paying to license it from a company with expertise in lexicography. It doesn’t come cheap. There will also need to be example sentences, both to illustrate meaning / use and for deployment in tasks. Dictionary databases can provide some of these, but they cannot be relied on as a source. This is because the example sentences in dictionaries have been selected and edited to accompany the other information provided in the dictionary, and not as items in practice exercises, which have rather different requirements. Once more, the solution doesn’t come cheap: experienced item writers will be needed. Dictionaries describe and illustrate how words are typically used. But examples of typical usage tend to be as dull as they are forgettable. Learning is likely to be enhanced if examples are cognitively salient: weird examples with odd collocations, for example. Another thing for the item writers to think about. A further challenge for an app which is not level-specific is that both the definitions and example sentences need to be level-specific. An A1 / A2 learner will need the kind of content that is found in, say, the Oxford Essential dictionary; B2 learners and above will need content from, say, the OALD. It’s easy enough to find artwork or photos of concrete nouns, but try to find or commission a pair of pictures that differentiate, for example, the adjectives ‘wild’ and ‘dangerous’ … What kind of pictures might illustrate simple verbs like ‘learn’ or ‘remember’? Will such illustrations be clear enough when squeezed into a part of a phone screen? Animations or very short video clips might provide a solution in some cases, but these are more expensive to produce and video files are much heavier. With a few notable exceptions, such as the British Councils’s MyWordBook 2, design in vocabulary apps has been largely forgotten. 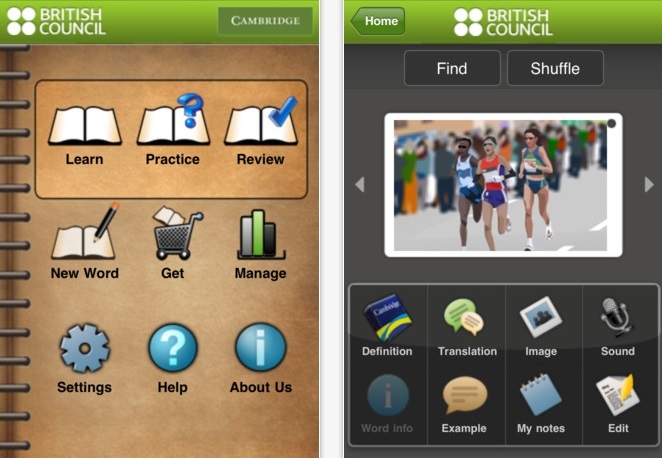 Many learners will want to use a vocabulary app in association with other course material (e.g. coursebooks). Teachers, however, will inevitably want to edit these lists, deleting some items, adding others. Learners will want to do the same. This is a huge headache for app designers. If new items are going to be added to word lists, how will the definitions, example sentences and illustrations be generated? Will the database contain audio recordings of these words? How will these items be added to the practice tasks (if these include task types that go beyond simple double-sided flashcards)? NLP tools are not yet good enough to trawl a large corpus in order to select (and possibly edit) sentences that illustrate the right meaning and which are appropriate for interactive practice exercises. We can personalise the speed of learning and even the types of learning tasks, so long as the target language is predetermined. But as soon as we allow for personalisation of content, we run into difficulties. Maintaining motivation to use a vocabulary app is not easy. Gamification may help. Measuring progress against objectives will be a start. Stars and badges and leaderboards may help some users. Rewards may help others. But gamification features need to be built into the heart of the system, into the design and selection of tasks, rather than simply tacked on as an afterthought. They need to be trialled and tweaked, so analytics will be needed. Although the use of vocabulary flashcards is beginning to catch on with English language teachers, teachers need help with ways to incorporate them in the work they do with their students. What can teachers do in class to encourage use of the app? In what ways does app use require teachers to change their approach to vocabulary work in the classroom? Reporting functions can help teachers know about the progress their students are making and provide very detailed information about words that are causing problems. But, as anyone involved in platform-based course materials knows, teachers need a lot of help. Apps need to be usable with different operating systems. Ideally, they should be (partially) usable offline. Loading times need to be short. They need to be easy and intuitive to use. It’s unlikely that I’ll be seeing a vocabulary app with all of these features any time soon. Or, possibly, ever. The cost of developing something that could do all this would be extremely high, and there is no indication that there is a market that would be ready to pay the sort of prices that would be needed to cover the costs of development and turn a profit. We need to bear in mind, too, the fact that vocabulary apps can only ever assist in the initial acquisition of vocabulary: apps alone can’t solve the vocabulary learning problem (despite the silly claims of some app developers). The need for meaningful communicative use, extensive reading and listening, will not go away because a learner has been using an app. So, how far can we go in developing better and better vocabulary apps before users decide that a cheap / free app, with all its shortcomings, is actually good enough? I posted a follow up to this post in October 2016.